Northern spring salamanders are an amphibians species that belong to the Plethodontidae family, the lungless salamanders. It’s Latin name comes from the Greek name of a purple stone, the porphyry and for this reason northern spring salamanders are often called purple salamanders in reason of it’s colours. Northern spring salamanders are quite large amphibians reaching up to 23 cm but usually they grow between 12 to 20 cm. Their back colouration varies from salmon to pink or reddish. Canadian individuals of these amphibians tend to have a net-like pattern on their back. 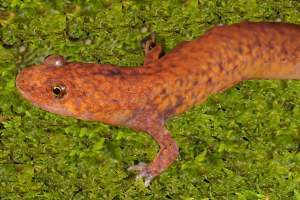 The northern spring salamanders is often confused with other species like the Northern Two-lined Salamander, the Northern Dusky Salamander and the Four-toed salamander but differs by having a light line extending from the eye to the nostril. There is four sub-species of Northern spring salamander in North America but in Canada only Gyrinophilus porphyriticus porphyriticus can be found. The Northern Spring Salamander is territory is limited to extreme southern Quebec but historically it could have been also present in Ontario but their in no recent reports of viewing in this province. Northern spring salamanders is usually found in cool mountain springs, but it can also be found in any wet depression beneath logs, stones, or leaves in the surrounding forest. Northern spring salamander can lay up to 100 eggs which the females attached individually on the lower side of rocks in cool water springs. Larvae hatch in late summer or fall and may take up to four years before transforming into juveniles. Northern Spring Salamanders are sensitive to changes their environment and in water quality. Given the rarity of this species in Canada it has been designated Special Concern by the Committee on the Status of Endangered Wildlife in Canada, the COSEWIC..